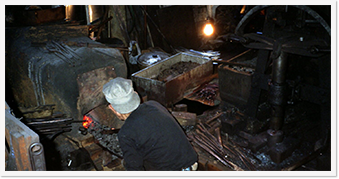 Established in the Showa period, Yamawaki Cutlery MFG.,LTD is engaged in the business of manufacturing and sales of Japanese kitchen knives in Sakai, Japan. With a wide range of knives for home cooks to professional chefs, we certainly have something for everyone. Our flagship brand is Goh Umanosuke Yoshihiro, which gained popularity overseas in recent years because of its unparalleled sharpness and superior quality. We also support OEM production (excludes certain items), so please feel free to contact us via email/phone. We procured the rich history of Sakai knives that started back in the 16th Century, producing high-quality knives by skilled craftsmen. In Sakai, we want to continue this tradition by staying true to its technique but also strive to make improvements in collaboration with the craftsmen to create a truly unique, innovative, and one-of-a-kind knives. Our company takes great pride and responsibility to say, "Made in Japan." We aim to create excellent quality by continuing to devote our time to traditional knife-making techniques for the foreseeable future. And as we progress forward, we anticipate building long, productive business relationships. Our company is a good standing registered Sakai City companies and a title of "Sakai Wazashu (Guild member of Sakai)” is granted to us from The Sakai Chamber of Commerce and Industry. Copyright © Yamawaki Cutlery MFG.,LTD,All rights reserved.